I kind of felt bad, a little, because it seems as though I am mainlining fat these days, which is not usually a big deal to me because on the one hand, obesity is a serious illness and bad things happen to you and you can’t buy clothes at regular stores and diabetes and blah blah blah. But on the other hand, if I get super fat, maybe I’ll qualify for disability benefits and then I won’t have to go to work or worry about clothes – I’ll get to sit around eating deep-fried stuff all day while wearing a muu muu and completing that novel I keep pretending I’ll ever finish, and maybe the government will even pay for cable. If I get Nick super fat too then I won’t even have to worry about him leaving me for someone with a neck. These were my thoughts this morning as I pondered the last of the buttermilk that I inherited from my neighbour and Grace’s friend, Ayesha, who is heading to Kenya suddenly and needed help emptying her fridge. I started a little batch of crème fraîche on my kitchen counter (one cup heavy cream to two tablespoons of buttermilk, left to sit in a jar at room temperature for 18 to 36 hours until thickened), and then there were leftovers. And I have two apples, which I was going to eat the way one normally eats apples, but then I realized, I’m on vacation and we’re moving in two weeks so any time I am not spending feeding us or checking the mail or procrastinating should be spent packing and that’s when I got out the grater and started heating the oil. I can justify pretty much anything, by the way, in case you hadn’t noticed. Anything. Mix together all ingredients except for the apple until well combined. Fold in the apple, and let rest for ten minutes. In the meantime, in a heavy-bottomed pot, heat about two quarts of oil to 350°F, or until a little splotch of batter dropped into the oil fizzles immediately and rises to the top. Now you get to decide how big you want these things to be. I used a spatula to awkwardly ladle these out, but you can make them as big or as little as you want. My way made eight. Keep in mind that the cook time will vary, but I fried my fritters for about two minutes per side, until they were deeply golden and crunchy-looking. Once the fritters are fried, cool on a few sheets of paper towel. 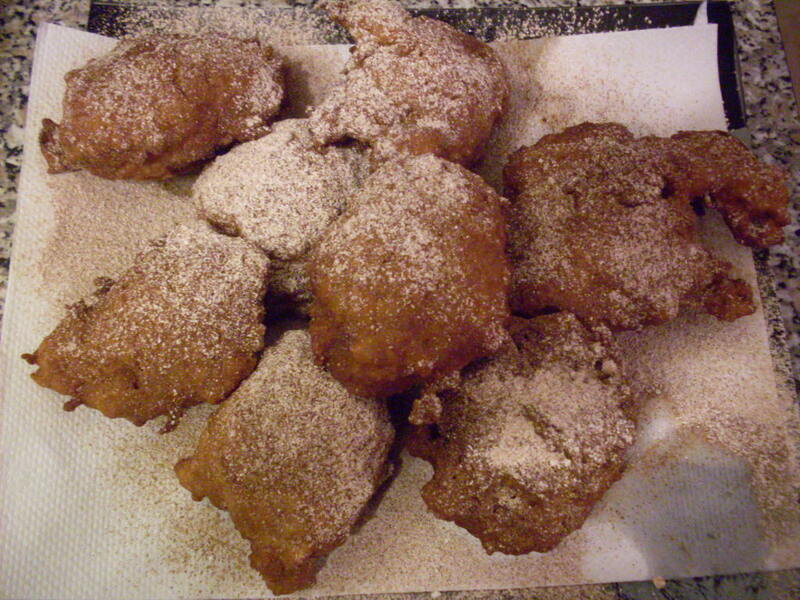 Sprinkle cinnamon sugar mixture over top of hot fritters, and serve immediately. If you are also on holidays, feel free to crack open a chilled bottle of Gewurztraminer as well. Maybe don’t eat them all in one sitting. This kind of thing is good for sharing, which is great, because it’s the kind of thing that people will love you for sharing with them. They’re crispy, spicy, appley, and wonderful – better than store-bought, and they’ll be gone almost as soon as you put out the plate. < Previous When I was a kid, waffles meant it was a very good day. Next > Bulgur risotto, with lima beans or peas or whatever you’ve got in your pantry, freezer, or fridge. You’re truly my soul sister. This Sunday I got up earlier than my partner and made him breakfast — spicy candied bacon (oh my!) 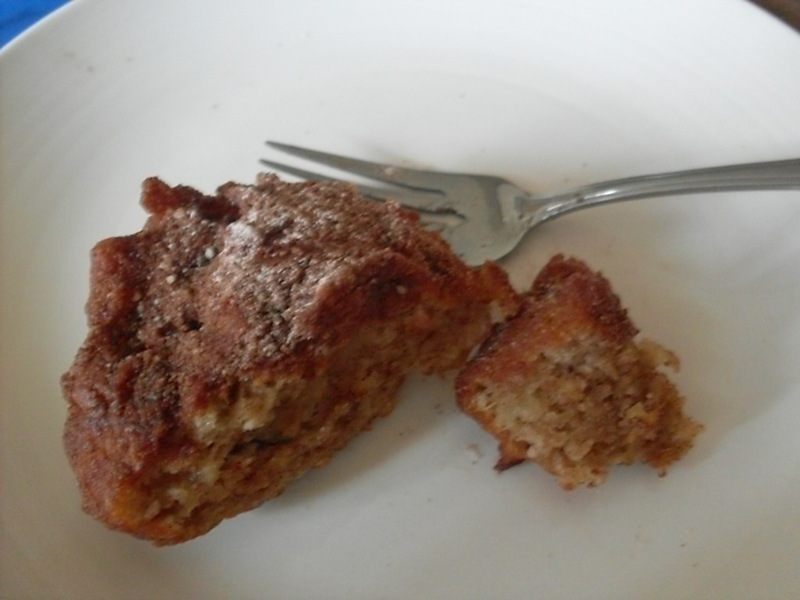 and sourdough apple pancakes (not too dissimilar from your delicious looking fritters). Yummm. Now I have doomed myself to repeat performances, not because he is demanding one, but because I am. And oh yes, I did say spicy candied bacon. I am going to need you to move close by. That breakfast sounds amazing, and I almost don’t want to eat anything else until I can get me some of that sweet, spicy bacon … wanna share the recipe? Line a cookie sheet or jelly roll pan, the kind with edges that stick up because grease might drip, with parchment paper. 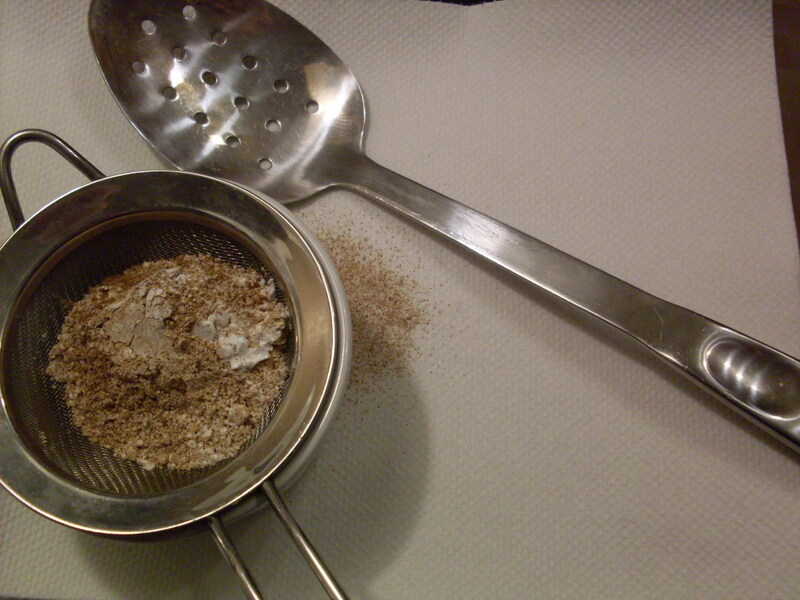 Then mix sugar and chili powder (I used probably 1 cup granulated sugar, 1/4 cup brown sugar –unnecessary–, 1/2 teaspoon black pepper, 1 teaspoon chili powder, and 1/2 teaspoon chipotle powder … but it was fussier than it needed to be because no subtleties will be detectable. I recommend black pepper and something spicy — my partner liked chili powder in there because the ancho chilis reminded him of chili salted mangos). 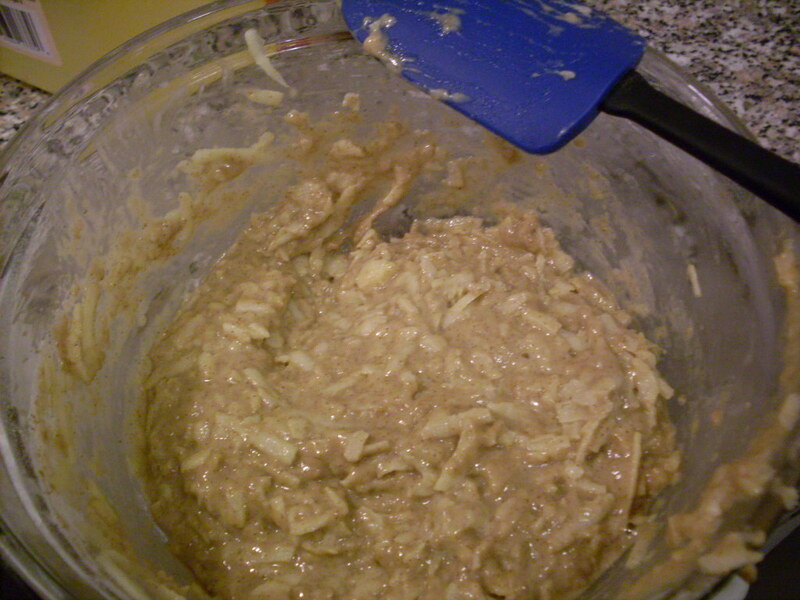 Rub this mixture into bacon slices, one at a time. I did 6 rashers and could have probably fit 8 on a cookie sheet. You really want a lot of sugar adhering to both sides. Then I baked it at 375 for about 30 minutes (I didn’t time it, just pulled it out when it seemed done). To tell the truth, I just went about my business making pancakes and voila, it was done when I wanted it. Magic! Do use tongs to retrieve the bacon from the rather greasy syrup, which will be boiling. The pieces that got crispy (at the ends of the cookie sheet) shattered nicely and were wonderfully crunchy. The softer pieces were like sweet, spicy bacon jerky. I will have to repeat the experiment to see which way I prefer it. Do try it! Do use parchment paper, as it’s nice to just let the grease/syrup cool and then throw it away, rather than scrubbing it off your cookware! I was probably not too clear. You want to really knead the sugar mixture into the surface of RAW bacon. Then bake it. Yum. I am going away this weekend and am totally going to make this for breakfast one of the mornings. I think everyone will love it. I haven’t even started and I can smell it already! Thanks for the tip!